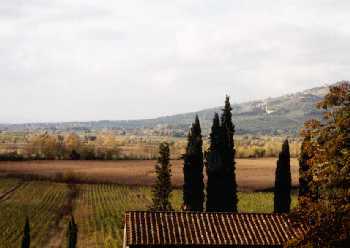 Casale Girasole and Casa San Pietro are conveniently located about 5 km (2.5 miles) from Cortona in the quiet rural plain surrounded by beautiful green hills. You can reach the local village center by foot where you will find a grocery store, cafÃ©, pizzeria and florist. Other small villages with stores (bakeries, butchers, mini-markets) are within walking/biking distance. Cortona is a splendid medieval town located on a hilltop with origins dating back to Etruscan times. The area is so culturally rich in art and architecture that you must make time to visit some of the museums and art galleries such as the Etruscan Academy and Diocesan art museum. The Cortona area also played an important part in the life of St. Francis who founded the enchanting Le Celle Sanctuary just outside the city walls. 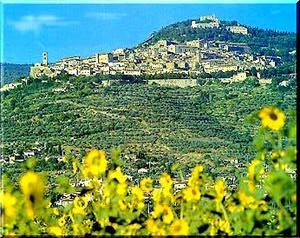 Cortona is also a modern city with a full selection of shops, professional and health services. Cortona has attractions all year round: outdoor restaurants in summer, festivals and sagre dedicated to local culinary specialties, antiques shows, movies and concerts. The Cortona area abounds in antique & craft markets, art exhibitions, theater performances, olive oil & wine production and tasting, and local artisan workshops making ceramics, wrought iron and wooden objects. 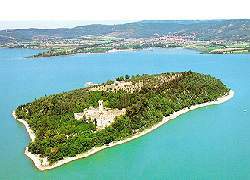 In 217 BC, Hannibal defeated the Roman Army in the famous battle on the nearby shores of Lake Trasimeno, located 10 minutes from Cortona. The beach areas offer swimming, windsurfing and pedal-boat rental. Ferry service is available to two of the three larger islands, including Isola Maggiore with lace-making workshops and castle ruins. 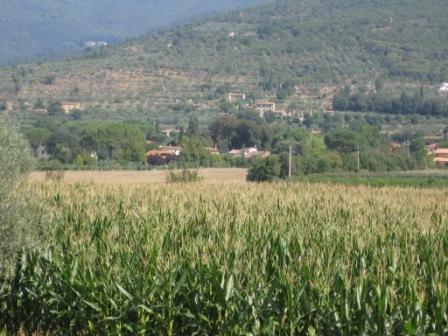 The closest train station to Casale Girasole and Casa San Pietro is in Terontola, about 10 minutes by car and 20 minutes by bicycle. 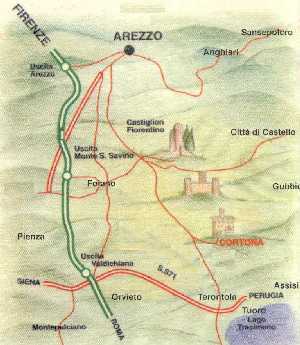 The Terontola-Cortona station is quite well-connected for travel to Florence and Rome, as well as Perugia, Assisi, Orvieto and Arezzo. Italian trains offer an inexpensive and relatively easy way to get to the main cities although having a rental car would make day-trips easier, especially to the smaller, quaint towns in Tuscany and Umbria. Florence 1.5 hours, Siena 1 hour, S. Gimignano/Chianti 1.5 hours, Arezzo 30 minutes, Perugia 30 minutes, Assisi 50 minutes, Pienza/Val d’Orcia 45 minutes, Montepulciano 45 minutes, Montalcino 1 hour, Orvieto 1 hour, Rome 2 hours, Fiumicino Airport 2.5 hours.